Itchin’ for some finger pickin’? Sign up for Banjo Lessons at Centre Music House where you can learn everything about the banjo from basic rolls and licks to fast-picking bluegrass and solos. The Banjo stands as an iconic instrument in any bluegrass or folk arrangement. Originally an African instrument, the modern Banjo comes in the 4-string, 5-string, or 6-string variety. The Banjo is hot again thanks to contemporary folk and bluegrass bands like The Avett Brothers and Mumford and Sons. Our Banjo teachers offer students a step-by-step approach to learning how to play the banjo. As you progress through your banjo lessons you and your teacher will explore advanced licks, improvisation, and unique styles. You may also bring in specific songs you would like to learn and your teacher will help you transcribe the music so you can learn it at your own pace. 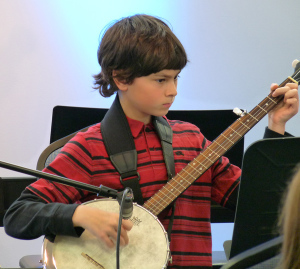 Our banjo students range in age from 8 or 9 to adult. Start learning how to play the banjo today!